Since 1952, RA Mueller has been serving Ohio, Indiana, Kentucky and West Virginia providing a wide variety of high-performance fluid handling solutions. RA Mueller meets your needs with top-name products for fluid transfer, fluid mixing, fluid metering, heat transfer, mechanical seals and rotating equipment accessories. 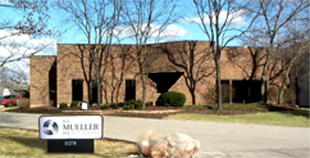 RA Mueller can help you solve challenging applications cost-effectively. Whether you need to mix and transfer abrasive, viscous sludges, or meter small doses of expensive chemicals, RA Mueller provides the best customer value - exceeding your expectations at every step. With its large staff of experienced specialists, RA Mueller ensures that your unique application requirements and deadlines are met. Sales engineers and application professionals analyze your process in order to provide a product or system that optimizes cost-efficiency without sacrificing performance. Along with the right people, RA Mueller stocks and distributes products from an exclusive group of the most reputable manufacturers with brand names you know and trust. To serve you better, the Company maintains reliability and repair centers throughout its coverage area. Staffed by factory-trained technicians, these centers provide high-tech services including laser alignment, computer-controlled impeller balancing and metering pump calibration. RA Mueller's commitment to product quality doesn't stop when your equipment leaves the shipping dock. A variety of value-added services are available to help you achieve low total cost of ownership. Maintenance training from RA Mueller gives your personnel in-depth instruction on taking care of your fluid handling equipment. These seminars provide tips and procedures that can increase productivity, lower operational costs and limit downtime for maintenance. A variety of repair and asset management programs are available. These programs are tailored to customers' needs, and are directed toward reducing their total life cycle cost of equipment ownership. For emergencies, a team of field service specialists is on call 24 hours a day, 7 days a week, 365 days a year. They arrive quickly and work to get your operation back on line fast! With RA Mueller, you no longer have to endure long periods of downtime waiting for deliveries. It maintains over $3 million of components and equipment on its shelves that's ready to ship to you immediately. For even greater availability, a computer network provides RA Mueller access to $20 million in factory inventories from its suppliers making it your number one choice for high-quality products and genuine manufacturer's replacement parts.